On our first day in Hong Kong, we spent the afternoon walking around different neighbourhoods, mopping our brows, saying "it's so humid/ we need more water/ how can it be this hot?" etc every five minutes to each other and nipping in and out of stores for the air conditioning. 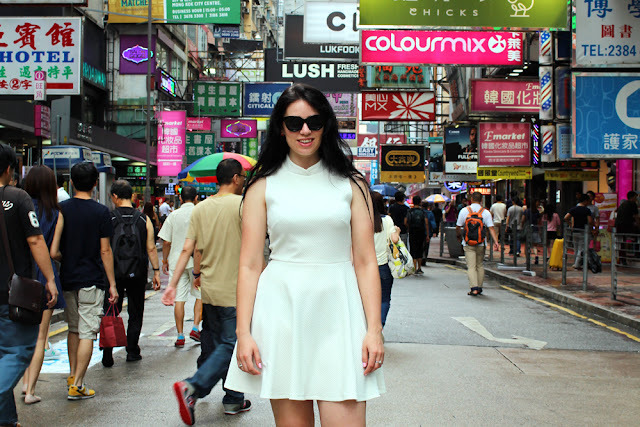 I wore my blue Nike trainers, a simple white Dorothy Perkins dress and ASOS cat eye sunnies. 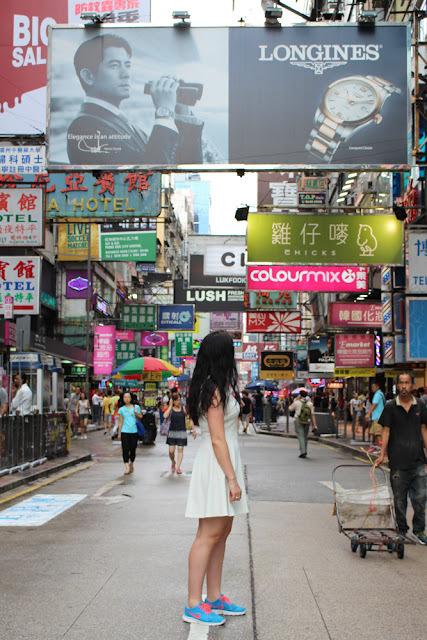 This is one of HK's many crazy busy streets, near Mong Kok. I meant to pick up a pair of trainers on nearby Fa Yuen Street (aka Sneaker Street), where dozens of sports shops and stalls sell hundreds of different sneakers from all over the world either very cheaply or tax-free if they're current season, but it didn't happen. Too much choice, too hot! Next time.